How do I love thee? Let me count thy ways…9-1-8 4-6-0 KXOJ! Each week, KXOJ honors couples celebrating their wedding anniversaries through a very special feature called Anniversary Honors. 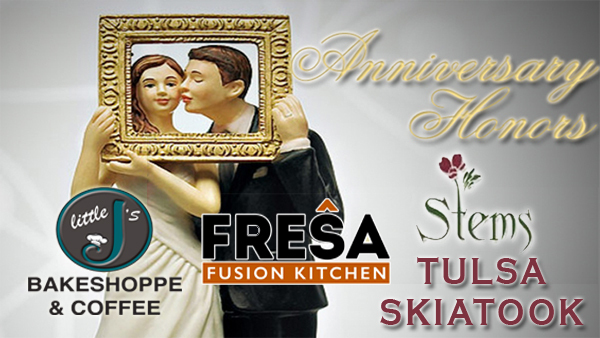 A delicious anniversary breakfast, lunch, or dinner for two at Fresa Fusion Kitchen. Fresa Fusion Kitchen in downtown Tulsa features a fresh variety of classic foods and signature beverages, located just half a block from the BOK Center! A gorgeous flower arrangement from Stems Floral Design, Tulsa’s ’s premiere family-owned florist. Stems at Utica Square and Skiatook create spectacular bouquets using the freshest blooms for weddings, anniversaries, birthdays, holidays, and other special occasions! A made-from-scratch, fresh-baked anniversary pie from Little J’s Bakeshoppe and Coffee, located in South Tulsa! Congratulations to you from Stems Floral Design, Little J’s Bakeshoppe and Coffee, Fresa Fusion Kitchen and 94.1 KXOJ! To participate in Anniversary Honors, just register below and tell us your anniversary date. If it falls on a weekend, we can announce it either Friday or Monday, whichever you prefer. You can also call us the day of your anniversary – as long as it’s before 9am. 918-460-KXOJ.